This election season has seen the rise of new styles of politics. We have already highlighted the filthy use of lies by politicians that seems to be penetrating it’s way into our virginal political landscape. On the positive side though, we are seeing the use of musical artists as a form of conveying the political message. Both the UNC-A and the PNM seem to have musicians lined up waiting to support them. Hopefully the COP will soon adopt this ‘new style of politics’ and join in on the fete. It is great to see how many of our musicians are so civic minded and interested in our political process. This seems to have even spread so wide that even our neighbours are interested in our politics. Thank you, Mr. Ritchie Spice and Mr. Miguel “Sizzla Kalonji” Collins. Your concern about our country is not going unnoted. It truly is great that we are importing such great achievements from our neighbour Jamaica. There are many things to learn from them such as their violence free elections where we certainly seem to be on track. We hope this trend continues. 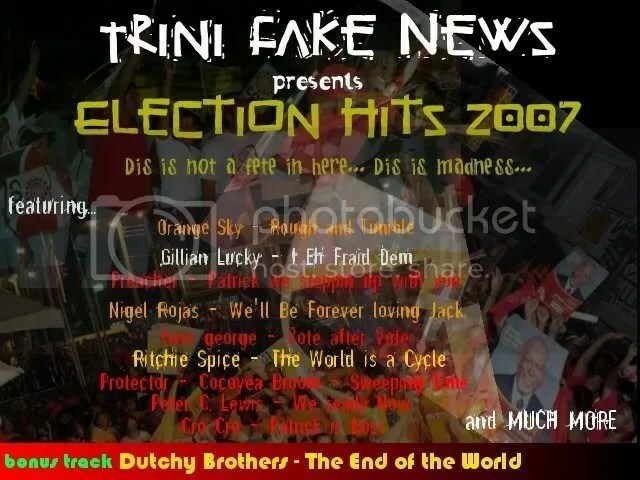 In honour of this new level of politics, Trini Fake News has decided to compile a CD with all the hits from this election season so that in years to come we may remember this glorious 2007 election season. We know that in the coming years we will be looking back at this election with tears in our eyes. You can purchase this CD directly from us. Send your requests to trinifakenews+cdsales@gmail.com. If you do not want to get 100 copies in your mailbox, please tell us how many you would like to purchase. The CD’s are selling for $200.00 at record stores nationwide. However, if you contact us directly it can be yours for $99.99. We’ll even throw in a free surprise gift to the first 100 customers. See below for the CD cover.